Did you know even big-budget studios can create small, quirky, somewhat experimental games? You wouldn't guess as much from the constant march of AAA drudgery most produce, but it is indeed possible for a small team to work on a great, small title internally at an enormous game institution. And with a smaller budget—thus, less on the line—they can even try out some new ideas beyond the likes of Army Shootathon 2014. Crazy! 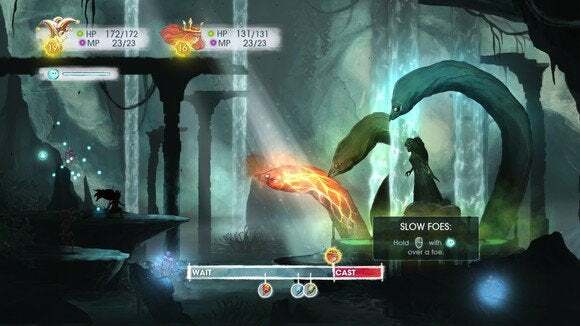 Apparently Ubisoft finally figured out not every game on the docket needs to reach summer blockbuster status, and so here we are: Child of Light, a 2D-sidescrolling game married to a JRPG-style, turn-based battle system and written in the style of a fairytale. Your first impression of Child of Light is probably the single fact that will stick with you longest: It's gorgeous. Ubisoft has worked magic with its UbiArt engine in the past, with Rayman Origins and Rayman Legends. Child of Light takes advantage of the same technology. The resulting world is soft—almost like a watercolor painting in motion. This is the definition of "more graphics doesn't always mean better graphics." 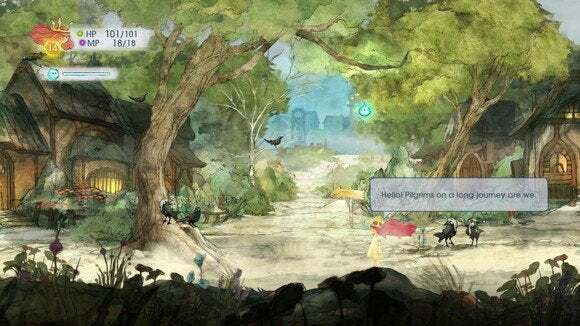 Long past the point where Battlefield 4 looks tired and old, Child of Light will still look like a beautiful game. 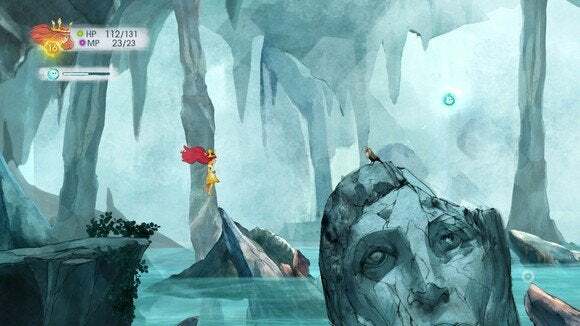 But if there was ever a case of style over substance (and believe me, there are a lot of those in gaming), it's Child of Light. The game is modeled after traditional fairytales. Young Aurora dies one night and wakes up in a dark, twisted world. As the titular child of light, she's charged with restoring this new world of hers to its former glory and banishing the forces of darkness—everything from oversized spiders to walking gargoyles to dragons to ghosts. She's not alone in her struggle, though. Along the way she meets a few much-needed friends who join her in battle, such as Rubella, the jester who misses her brother, or Finn, whose family was turned into crows. 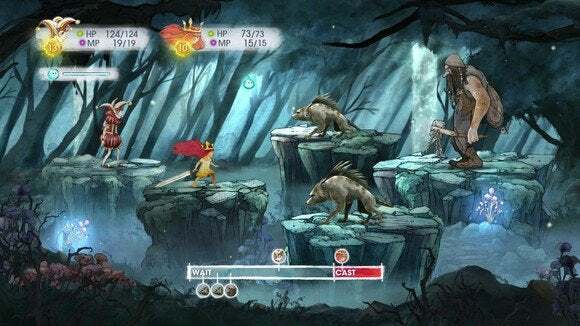 Despite the simplistic good-versus-evil, light-versus-dark story, there's a lot of potential in Child of Light. The game has plenty of room for interesting character interactions, let alone adding something new to its well-tread themes. And it just...never comes. Not for me, anyway. Characters don't get more interesting. The plot doesn't get more interesting. The world doesn't get more interesting. I suspect much of my apathy traces back to one curious design choice: All of the dialogue in the game rhymes. Now, thankfully, the dialogue is mostly written and not voiced. Hearing someone say these lines out loud would have been grating mere minutes into the game's twelve-or-so-hours playtime. Reading the dialogue isn't much better, though. It's gimmicky and contrived, and serves only to make the plot unnecessarily hard to follow as you try to dissect the pertinent information from the steaming entrails of poorly written poetry. It's awkward, like the kind of poetry you write after a bad breakup and then hide in a shoebox at the bottom of your closet. There's no rhythm to any of it so the rhyming feels forced, and you're left trying to discern just what the heck these characters are even trying to say. Even worse, some of the rhymes are cringeworthy. Not bad enough you're going to sit and stare at them and shake your head, but bad enough they'll stick in the back of your head and annoy you long after you're past that section. Ugh. Click to enlarge, if you want to suffer the pain of reading this. Just hours and hours of stuff like that. I see what the game is aiming for—matching the fairytale aesthetic to a type of nursery rhyme writing. But put into practice it's hard to follow, and the writing quality is uneven at best. By two hours in I was playing primarily because of the battle system, which features a blend of active and turn-based JRPG combat. Every character and creature in a given battle is represented on a bar at the bottom of the screen. These representations (character portraits) scroll across the bar from left to right, marking how much time until they attack. When the character or creature reaches the right side of the bar they enter "Casting" mode—the point where you choose which action to take, whether attack or defend or use magic or swallow a potion. Some of these actions take a long time. Others are nearly instantaneous. When you reach the right side of the Casting area, your character executes whatever action you put in. The catch? If some creature attacks your character with a faster action before you reach the right side of the bar, you're kicked out of the Casting area and have to wait for your next action. It probably sounds a lot more complicated laid out in text than it is while playing. Regardless, it's the most engaging turn-based combat I've played in years. There's just enough action to keep me interested, while still retaining the underlying strategic element. You're not just spamming attacks left and right. On the other hand, turn-based JRPG combat always falls prey to the same problem: patterns. You'll quickly identify patterns and optimal methods for defeating enemies, and then exploit those same attacks over and over and over. The first time you encounter an enemy is always the hardest time. Afterward you can look at a group of three enemies and know exactly which one you should attack first, what attacks to use, and when to defend. This problem is made even worse by the fact that normal mode is easy—so easy that Ubisoft is patching the game post-release to change the name from "Normal" difficulty to "Casual." If you have any videogame skill—and I mean any at all—you're going to be bored by the lower difficulty. Of course, the higher difficulty just requires more grinding, so it's also hard to recommend you play on that setting. In other words, there's a bit of damned-if-you-do-damned-if-you-don't here. It's refreshing to see Ubisoft experimenting with smaller, more personal games. It's a market well-served by independent developers, and I'd welcome more attempts from larger studios if it means taking some risks—after all, that's basically the financial model used by the film industry (smaller, riskier titles funded off the back of summer blockbusters). 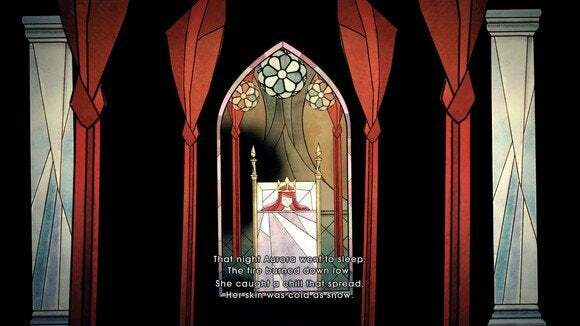 However, Child of Light plays it a bit too AAA-safe. The story is nigh-incomprehensible at times, and it never congeals into a big moment of catharsis. While that's fine when the focus of the game is explosions and pretty graphics, it's a harder sell in this type of quiet, personal game. But boy, is it pretty to look at. 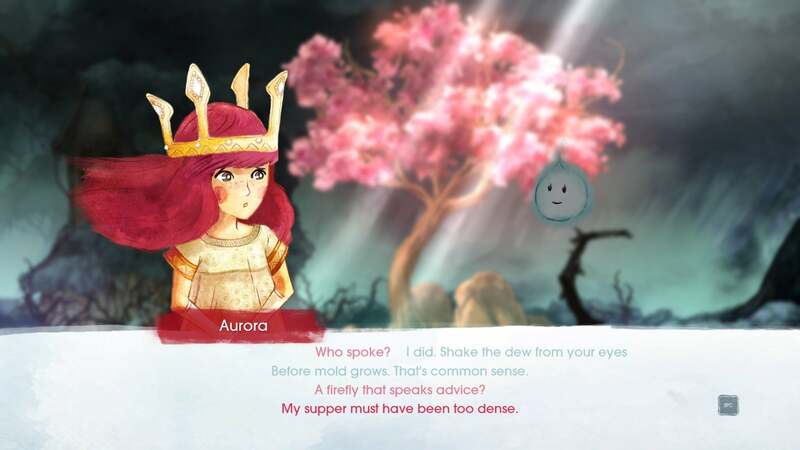 Child of Light is all-style-no-substance. And while that's certainly not rare in big-budget games, this tiny experiment from Ubisoft suffers as a result.